Wood planers are some of the most important tools you can have in your work space, but there are many types to choose from. Having the best wood planer available is essential to creating the best quality work possible. Purchasing a mediocre device will provide mediocre or worse results and result in a waste of your own money and time. This site serves as your all-in-one resource for information about the best hand planers, thickness planers, jointer combo units and more. Here you can find wood planer reviews for some of the best models of all types. 1 What is a Wood Planer and Why May You Need It? 1.1 What is a Planer Tool? 12 Where to Buy a Wood Planer? What is a Wood Planer and Why May You Need It? If you have experience with extensive professional or hobby woodworking projects, you understand how important and useful it is to have a wood planer at your disposal in your shop or work space. Custom ordering wood from a supplier is always an option, but it can be costly or complicated if you have very specific or unique needs. Having a wood planer handy allows you to modify your wood pieces right as you need them without passing instructions to another party and waiting for a result you can only hope matches what you had in mind. Those unfamiliar with wood planers often think they have the same functions or purpose as jointers, but they are different devices with different purposes and capabilities. A planer is a tool that is used to create wood boards of even thickness that are completely flat in shape. These tools are also helpful with projects that require edges to be joined together or beveling the edges of doors to perfection. The first wood planers were small handheld tools, but those produced today come in many varieties. Handheld planers are still very common, but larger electric wood planers into which wood pieces are fed are also used quite frequently. Modern planers are powerful machines that allow for manual or electronic control of quick thickness adjustments. When the wood planer is used, the cut depth must be set before powering on the machine. This is done by either adjusting the cutter head or the planing platform. As the wood board is fed into the device, the in-feed roller carries it towards the blades of the cutter head. After it is appropriately planed, the out-feed roller moves the completed piece out of the machine. This process allows for a smooth and accurate reduction of the wood piece’s thickness in just a short time. Using a planer in this way allows you to utilize various pieces of wood that you have available and create uniform thicknesses based on the needs of your project. This helps save money not only because you can use wood that you had no purpose for beforehand, but you can also buy cheaper pieces from your lumberyard. As long as the initial wood is of acceptable quality, you can use nearly any piece to achieve the required thickness by running it through a planer. Reclaiming old wood pieces is one of the most convenient benefits of a wood planer, but some woodworkers are hesitant to do so. Some may claim that using old wood in this way may deteriorate the blades faster and affect their sharpness. Considering the costs of good quality wood, recycling old pieces is a cost-effective method. Even if it means replacing the machine’s blades more quickly, it is only a loss of around $30 to $40 every so often compared to constantly purchasing new wood pieces. they are so powerful, they can be potentially dangerous to the worker or detrimental to the quality of the final results. Planers are not the types of tools that inexperienced workers should attempt to use right away. Trying to use a planer without the proper knowledge or skills can result in sniping, tear outs or sloped wood surfaces. Incorrectly using a wood planer creates consequences that only increase work time, wasted wood product and the final cost to finish the project. It is essential to take the time and effort to completely understand how to operate a wood planer in addition to practicing with the guidance of an experienced user before using one for serious projects. A hand planer is a handheld wood plane that is used to thin or flatten a wood piece. They are used to produce flat surfaces on pieces that are too large for shaping. Hand planers combine a cutting edge with a solid body, and they are scraped across a wood surface. After several passes of the tool, the uneven parts of the wood’s surface are flattened. These tools are best for use on smaller pieces and smaller tasks that do not require rapid shaving of the wood surface. One of the best benefits of the hand planer is the fact that it is an inexpensive tool. Hand planers can often be found at flea markets and garage sales for an even lower cost. While some people think of them as being outdated, they actually serve many functions and can prove to be quite useful. Having one handy can reduce costs compared to using larger models or even buying a new hand planer. 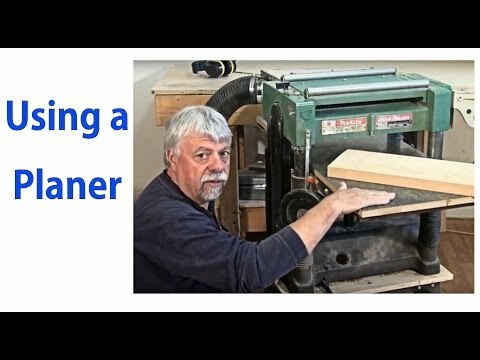 Hand planers can shave wood in many ways that electric planers cannot. Many woodworkers still use these tools for versatility and the ability to accomplish tasks that would not be as simple with electric planers. They provide the finest smoothing action even where electric planers fall short due to thickness limitations. The downside to hand planers is the fact that they are not power tools, and they lack the more automatic functions of planing machines. They cause more fatigue and more time spent working on a wood piece because of this. A thickness planer is a woodworking machine that is used to trim boards to a desired thickness by making them evenly flat on both surfaces. A thickness planer features a cutter head with knives, feed rollers to bring the wood into or move it out of the machine and a platform that can be adjusted in order to control the thickness of the board. In comparison to hand planers, thickness planers are best used for larger sizes and larger volumes of wood. They are meant to be used with boards that already have a flat surface before being fed into the machine, and they can also be used to reclaim older pieces of wood. These types of planers create a consistent thickness throughout a piece of wood. Thickness planers can be used to reclaim warped and uneven wood pieces and prepare them for new projects. They can also help you to save on the price of buying wood from a lumberyard. You can purchase rough wood from the lumberyard and convert it into usable pieces with a thickness planer. The drawback of standard thickness planers is that they can take up lots of space in a work area, but there are smaller types available. These types are not as powerful as standard models as they tend to use commercial motors, and this requires more passes to reach the desired thickness. These factors can also contribute the sniping. Many serious wood craftsmen have a difficult time deciding between a jointer or a planer. While they may seem to have similar functions to those not familiar with each tool, they actually serve very different purposes. The good thing is that the two tools don’t have to be purchased as separate units. Also known as surface planers, jointer planers allow you to do both tasks in the same machine. Jointer planers are best used when jointing and planing are frequently done together. Jointers can flatten the edge of a board in order to join the edges of additional boards in addition to flattening the face of a board. The benefits of a jointer planer are the convenience of having a combination of both tools readily available and the amount of money saved on buying each separately. You also save space in your workshop by having two devices in one. The best surface planer models are high-quality tools that are very effective to use. They are powerful, lightweight and often cost no more than portable planer models. The downside to any powerful machine is the fact that it takes time to use safely and appropriately. Operating a jointer planer combo without proper knowledge or prior experience can be very dangerous, so the correct safety precautions must be taken before and during operation. This includes wearing the correct safety gear (such as earplugs and goggles), ensuring the unit’s cutter guard is set, utilizing the unit’s fence to keep the wood straight while being cut and using a push block to move the wood through the machine. All safety procedures you can find here. Portable planers have the same functions as standard models, but they are made to be more easily moved from place to place. Many people prefer these models compared to stationary types. Portable planers are best for light planing use in work areas where space is limited. Many modern portable planers are much more affordable than industrial models. Sometimes they may cost as little as one-third of the cost of the latter, and they can return the investment costs within as little as a year of operation. Portable planers are also very easy to use. Instead of driving a standard unit, a portable planer requires much less effort because the piece is simply guided along the chosen path. These tools make great machines for those wanting to save room in their work space. Portable planers can often be used in place of jointer planers, so they are helpful to use for smaller projects. They can be more accurate for this purpose due to their size as well. Portable small wood planers use motors that can sometimes provide high RPM and extremely smooth surfaces. Compared to typical planers, their lightweight body and efficiency make them quicker. Because of their build, portable planers are expected to have certain advantages over heavier stationary models. Unfortunately, some models can be a bit bulky and heavy considering their size. Some portable planers are also very loud and may have more rattling. They fall short of standard planers when large quantities of wood are being prepared for a jointer or project. A benchtop planer is a small and compact type of traditional planer. They have evolved over the years from gaudy machines to streamlined and technological tools with ergonomic enhancements. Like other types, benchtop planers can be used to surface cheap and rough wood stock instead of having to buy new lumber each time. Both thickness planers and jointers have benchtop styles. For an affordable price, you can bring a table top planer into your workshop. When used correctly, it can help save money through reclaiming unused wood to dedicate to new projects. Because of their relative power and size, they work best when removing small amounts (1/16″ or less) at a time. These planers work great for small shops that don’t have high production demands. Benchtop planers can easily fit into small spaces or on work benches. Their compact size makes them convenient to add to a workshop without shuffling around other tools. These mini wood planers also tend to be much more affordable than larger wood planers. While they are very capable machines, you should not expect benchtop planers to have the same capabilities as traditional models. Standard planers have larger motors with high horsepower, and they can cut through the densest woods and go deeply with little problem. Benchtop planers feature universal motors, and they take much longer to surface wood compared to standard units. Hand planers are the original form of the tool. They feature a serrated edge that is parallel with the surface of the wood that moves from the thinner to the thicker area. This allows for shaving of the wood strip by strip. Handheld planers are best used for finishing, so they can be kept as side tools. The benefits of these tools is the fact that they can be used anywhere without electricity or special set-ups. They are inexpensive by comparison, and they can often be found for reduced prices at garage sales or flea markets. The typical hand held planer can even shave wood much better than a modern wood planer, and this is why many woodworkers keep them on hand. Hand planers provide the finest smoothing changes compared to electric models that must shave off a minimum thickness. The downside to these tools is the time it takes to level the wood and the fact that many wood chips are left behind. They are also not suitable when a piece requires a thickness reduction of over an inch. There are many planers of this type on the market, so we have provided hand planer reviews to help buyers make a wise decision. The Makita KP0810 is capable of cutting, reducing and shaping wood while also leaving a smooth finish. It features a powerful 7.5 amp motor that actually offers more power than many larger planers. The unit has a cutter head featuring two blades that can cut up to 3.25 inches wide and 5/32 of an inch deep, and it has a speed of 16,000 RPM. It also works well on damp and freshly cut wood just as nicely as it does on dry wood. For rough surfaces or freshly milled wood, the Makita KP0810 only takes a couple of passes to smooth them out. The unit has a convenient light weight of just 7.3 pounds and an elevated base to protect the blades and wood piece from damage. It also has a rubber handle with lock-on/off switches on both sides. The Makita 1002BA is significant in that it is one of the best hand planers to use when creating arches. It is an easy machine that can work through normal board effortlessly, and it can cut through end grain cuts without losing stability. It provides highly accurate cuts with complete control when operating. The unit has a two-handed design that allows for better performance and accuracy, and it features large front grips for comfort and control. The only drawback to the Makita 1002BA is its heavier weight, but this is to be expected with its 11-amp motor. The motor on this planer offers a nearly unparalleled level of power. As the best power planer for handheld use, the Makita 1002BA is made for workers that may use it for personal and professional purposes. The Bosch 1594K is a well-designed and balanced electric hand planer with powerful and adjustable blades. It features a 6.5-amp motor that operates at 16,500 RPM. Its depth control is easy to adjust, deep and accurate. Its fence can be set to any angle without concern for depth and width. It has an adjustable rabbeting stop that allows for going as deep and as wide as necessary. One of the most impressive aspects of the unit is its sound. It barely makes any noise, and it features a vacuum adapter that never loses contents. The Bosch PLH181K features a counterbalanced blade system design. This allows the blades to be placed at the finest cutting angles and reduces drag. The unit’s rare earth magnets allow for smooth operation as they provide the unit with a higher ratio of power to weight for a lighter feel. The Bosch PLH181K has ergonomically-designed gripping handles so users may operate the device for long periods without stress on the hands. It also features a convenient chip ejection switch that allows shavings to be ejected to the left or right depending on user preferences. The unit is also convenient in that it can charge in as little as 30 minutes. The SKIL 1560-01 was made to provide DIY workers with the power, performance and durability they need in one reliable device. It features a 5.5-amp motor that makes it one of the more superior planers in its class. The power hand planer offers impressive perfection and accuracy when operated, and it has a surprisingly low price despite its performance. Its two reversible carbine blades and the unit’s front and rear shoes ensure smooth cutting. It also has a storage area for wrenches for added convenience. The Skil 1560-01 makes a great addition to anyone’s tool collection whether they are a novice or experienced professional. The DeWalt DW680K is a highly efficient and very portable hand planer that is ideal for taking off large quantities of wood in a short time. It features a 7-amp motor that operates at 15,000 RPM, so the unit is strong enough to take on even the hardest woods while leaving a smooth finish every time. It has a combination of quick speed along with precise cutting from its carbide blades that makes it suitable for framing along with straight cutting needs. It takes off 3/32 of an inch in a single pass for removal of more wood in less time. The DeWalt DW680K accepts both high-speed steel along with reversible carbide blades. It also has an ergonomic handle and design that reduce stress on the hand and arms. A thickness planer is used to create wood pieces that have a uniform thickness, and it is especially useful for renewing warped pieces. Utilizing old or damaged wood pieces helps save on the cost of purchasing new wood for each project. There are many thickness planer models from which to choose. Our portable thickness planer reviews provide information on some of the best performing models available. The DeWalt DW734 is an efficient and powerful planer offering 15 amps and 20,000 RPM from its motor. It features a three-knife cutter head that can make up to 96 cuts per square inch with some of the finest finishes possible. Reversible knife edges on the cutter blade provide additional efficiency and longevity. The DW734 has strong and durable knives that are also disposable and easy to change. The unit features a four-column carriage lock that significantly reduces snipe along with long in-feed and out-feed tables that offer a total of 33.5 inches of base support. The DeWalt DW734 is one of the best thickness planers for both DIY enthusiasts and professionals. 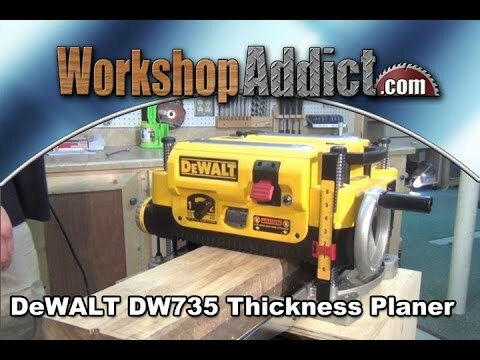 The DeWalt DW735 is one of the best portable thickness planers available. The extremely powerful device can handle nearly any type of wood from traditional to exotic. It has a powerful 15-amp motor that can make deep cuts into hardwood along with a durable system of blades. It has a two-speed gearbox and three-knife cutter head that can make virtually any cuts you need. The DeWalt DW735 uses razor sharp cutter knives that are reversible and reusable. This wood thickness planer has a motorized fan that helps break up wood debris and blow it into one of the unit’s dust shrouds, and one of those can be connected to a vacuum. Its features a four-column carriage lock that reduces sniping. An electric planer review would not be complete without the 735X. The DeWalt DW735X is the perfect tool for planing, and it operates nearly as well as a commercial planer. The strong tool features a 20,000 RPM motor with a 10,000 RPM cutter head speed, and it can work through harder and larger pieces with little effort. The machine is so precise, there is hardly any sniping. Unlike many other machines, there is no concern for sniping on the ends of the board when using the DeWalt DW735X. The three-knife cutter head offers a 30 percent longer life and allows for quick and easy changing. As one of the best electric planers, the DeWalt DW735X is one of the few tools that meet the capabilities of industrial planers as it performs to near perfection. Many woodworkers struggle with trying to decide whether to buy a planer or jointer. Serious workers understand the significance of the benefits both tools bring to the table. Fortunately, some tools combine the functions of a planer and jointer and allow you to switch between the two as necessary. Many of the models in the following jointer planer reviews make switching completely easy. The ability to use both functions in one device saves time, money and space. The models in these surface planer reviews are some of the best tools that stand out, perform well and offer great versatility. The JPM-13CS is a powerful jointer planer that offers 230 volts and a 1.5-horsepower motor. It is suitable for those working at home as well as those with professional woodworking shops, and it is much easier to use compared to small planers as it offers precise cutting. Its superior cutting allows for accurate thickness results, and it can work on both soft and hard woods. It has three knives that can last for years and require little maintenance or replacement. The JPM-13CS is easy to move around a shop, garage or other working space due to the small rollers on its base, and it has reduced vibration to operate without being too shaky or noisy. The only downside to this machine is the excessive wood shavings it produces. Woodworking can be a hassle without having all of the right tools at your disposal. This begins with a dependable planer for wood, but a jointer is often typically necessary to flatten and straighten misshapen wood pieces and edges. For serious workers, it is best to have a combination of both tools. The Jet JJP-12 is a compact and easy jointer planer combo that is adjustable. It has a powerful 13-amp motor, and it switches between jointer and planer modes effortlessly. The Jet JJP-12 features three high-quality knives that offer precise wood cutting. This unit is the best jointer planer combo when it comes to added features. It has a self-locking security system for enhanced safety, a dust collector and conveniently designed controls to allow for user precision. The Shop Fox W1742 comes with cast iron wings, a movable iron table and a stationary headstock. These features help ensure that no wood cutting efforts are done in vain. The planer features a 3-horsepower 220V motor, two-speed gear box operating at 16 FPM and 30 FPM and a cutter speed of 5,000 RPM. Even those that only have previous experience with small planers will find the Shop Fox W1742 easy to operate and keep in control. The tool adds convenience in that nearly every component or part of the machine can be adjusted in some way. It also features a safety switch to protect against thermal overload. As far as performance, the Shop Fox W1742 offers near perfectly finished pieces that are precisely smooth. Many people prefer portable planers over standard stationary varieties. They are easy to use and only require guiding the planer along the necessary path. The best portable planers have lightweight bodies with fast speeds, and this results in great control and smooth finishes. The main benefit of the portable planer is its size, and the smaller size allows it to fit into tight work spaces. It can take the place of many other tools in one, and its size allows for more accuracy compared to standard models. Those in search of the best portable wood planer may find the right model by checking the following portable planer reviews. The Makita 2012NB is a 12-inch planer that has nearly everything workers need in a portable wood planer. It features a simple and compact design, provides the ability to change blades easily and quickly and operates quietly. Its Interna–Lok automated head clamp (exclusive to Makita) prevents tear outs in the wood piece and keeps the cutter head locked in place as it moves through. One of the best features of the Makita 2012NB is its extreme light weight and portability. It also features disposable double edged blades that can be replaced with ease. The unit features a 15-amp motor that is very powerful yet extremely quiet. It has a feed rate of 28 feet per minute to allow for quick and precise wood finishing. The Delta Power Tools 22-590 meets nearly all one’s best expectations for portable woodworking planers with regard to features, operation, portability and durability. It features a powerful three-blade cutting system with a long blade life to provide extremely smooth finishes. It utilizes the total width of the cutter head when planing and features adjustable width control. Its adjustable depth allows for consistent cutting. It features a patented lock for its cutter head that helps remove sniping, and its separate in-feed and out-feed tables help control snipes as well. The unit weighs 82 pounds and features a sturdy and durable build. The DeWalt DW735R features a heavy-duty 15-amp motor that operates at 10,000 RPM. It has a cutting head mechanism with three knives for ultimate precision and power, and it can provide 96 or 179 cuts per inch as determined by the dual speed gear box. It has a large aluminum base that is 19.74 inches in size to provide better stability to the unit, and its chip ejection uses a fan based exhaust system. The DeWalt DW735R makes a great tool for those that are new to woodworking or those purchasing their first thickness planer. It is a great choice for amateur users or those planning on personal use. Benchtop planers are another essential part of any woodworking shop. They are some of the best tools to use when working with wood. They are particularly useful for reducing snipe at the edges of a wood piece. The best planer in this category will also be able to smooth out edges with saw marks in just minutes. Reclaiming old pieces of wood is easy with benchtop planers, and it reduces waste and saves money. Scrap pieces can be used for smaller products or replacement parts instead of cutting into new wood. The following benchtop planer reviews detail some of the most impressive models. The Porter-Cable PC305TPR is an affordable benchtop planer that offers nearly all of the most important features in one device. It features double-edged knives that are made of high carbon steel, and they are also reversible to essentially increase their duration of use by two times. The unit is powered by a sturdy 15-amp motor that allows for the removal of even the toughest wood. The Porter-Cable PC305TPR features a Poly V belt cutter head drive in addition to a sprocket feed roller drive and a rugged gearbox that provides maximum transfer of power. The planer has a light weight along with integral handles that make it easy to carry around when necessary. The unit makes the perfect tool for household projects and hobbyists. If you need to create board pieces for rafters, flooring or any other application with perfectly even boards, the 40300H from the Steel City Tool Works is the best benchtop planer for the job. It allows for completing thickness tasks with precision and ease. The 40300H features 26 four-sides high-speed steel cutters operating at 10,000 RPM with a powerful 15-amp motor. It uses a helical cutter head that allows for longer cutting time and quieter operation. Along with its lack of noise, the unit features long in/out ramps to avoid sniping and the boards move through very quickly. The unit has an on/off feature for added safety and a depth cut gauge that indicates how much wood is to be removed with each pass. DeWalt is one of the most famous names in the power tool industry, and they are known for creating powerful and dependable instruments of all types. This brand creates planers of all kinds as well, and some of the highly recommended models found here (in various categories) are manufactured by DeWalt. The DW735X model from DeWalt is one of the most high-quality models available of any type. It has a motor that operates at 20,000 RPM while its cutter head works at 10,000 RPM. It is one of the most precise, easy-to-use and long lasting planers to use. Makita is a reliable wood planer brand, and they produce a number of high quality portable and hand planers. The Makita 1002BA is a curved base planer that allows for easily making arches in your wood. Its motor operates at 15,000 RPM, and it is a perfect tool for hobbyists needing to effortlessly create curves. The Makita 2012NBis an excellent thickness planer that is compact and light. It creates smooth cuts with no sniping, and it operates very quietly. The KP0810 is a powerful hand planer that works well for shaping all types of wood with a smooth finish, and it can be used on wet or dry pieces. Stanley is known for creating basic level block planes, and they are some of the oldest tools in the industry. Many older Stanley planers are purchased as collector’s items. This brand also creates a variety of simple woodworking hand tools. The Stanley 12-404 No.4 model is the best seller in hand planers. The 9.75-inch tool is adjustable and features a 2-inch cutter. It is made with hardened and tempered steel for durability and precision. It also features contoured high-impact polymer handles and knobs that provide for a better grip that promotes accuracy and extended use without fatigue. Jet is one of the leaders when it comes to jointer planer combination units, and they also make standard stationary models. The JPM-13C[easyazon_link locale="US" tag="woodworkingtoolslab-20" identifier="B00002265M" title="JET 708524 JPM-13CS 13-Inch 1-1/2-Horsepower Planer/Molder" ]S[/easyazon_link]model provides 230 volts of power that allows for easy and precise cutting. The unit can handle hard and soft woods, has reduced vibration and features base rollers that allow it to be easily moved. The JJP-12 is a compact, easy and adjustable jointer planer unit with a 13-amp motor. It offers a number of additional features including a self-lock system for safety and a dust collector. Both units provide the functions of a jointer and planer but allow for saved space in the work area. The Bosch name is well known as a brand that produces reliable power tools, and their planers meet expectations for both quality and performance. They make some of the most dependable hand planers on the market. The 1594K model offers exceptional performance with a 6.5-amp motor and 16,500 RPM. It has great depth control along with a beveling fence and protective shield that ensure better safety at many angles and widths. The PLH181K is a versatile and powerful hand planer that features a counterbalanced blade system that reduces drag and allows for fine cutting at all angles. Seeing as how there are many types of planers available, you must decide which one is the BEST for your typical woodworking tasks. This requires proper evaluation of your current challenges and goals in your workshop. You may have one type in mind only to realize another planer type matches much better with how you plan to use your machine. Your planer must be efficient enough to handle the typical load you place upon it. It should be able to produce significantly smooth pieces quickly and powerfully, and it should be able to continue to do so over time. Be sure to find a unit that will not be overwhelmed by the demand you place on it even if you have sudden increases in demand from time to time. You may need a powerful device, but you also need one that you or your fellow workers can operate easily. If your product demands call for more complex models, make sure you are completely familiar with controls and operation before use. It is better to start with a model that is easy to learn with while still being able to serve various applications. Planers are made with either induction or universal motors. Induction motors are more commonly found on bench and jointer models, and they are much more powerful. These motors are made for longevity and precision with long-term heavy-duty applications. Universal motors are often used with smaller handheld and portable DIY planer models. They offer the benefits of being small, cheaper and more lightweight. The ability to produce your preferred thickness is the main purpose of a planer. Based on the type of planer and the model, the unit will come with depth stops that allow you to quickly change the thickness. The stroke count is determined by the speed of the rotating blades as well as the number of knives on the cutter head. More blades amount to a higher stroke count. It is wise to choose a planer with variable speeds in order to employ different stroke counts as some woods come out smoother with a higher or lower count. The size of your planer will be an important factor if you have limited workspace. You need to be sure your unit is big enough to handle your workload, but it should be small enough to fit among your other equipment. You may also be forced to rearrange your work area to accommodate your planer. If you plan on purchasing a portable wood planer, the weight may be a much more important factor for you. You shouldn’t expect to easily lift any machine by hand, but your portable planer shouldn’t be too cumbersome to transport from place to place. Cost can be one of the most significant factors when it comes to purchasing a wood planer. The cost of a unit will vary based on the manufacturer and the quality or efficiency of a particular model. It is important to consider maintenance costs in the future in addition to initial purchase price. The goal is to find the best planer for the money without compromising quality in the process. Because they serve somewhat related functions, many people assume jointers and planers are essentially the same tool. This is not the case. Each unit serves its own distinct purpose, but one works to prepare wood to be used in the other. Jointers are used to flatten the faces of warped or bowed boards. They smooth edges so that they can be jointed together. A woodworking planer changes the thickness of a piece of wood by making it equal from end to end. Knowing what they are and what they do will help you determine how much preparation you need from your lumberyard and how much you can handle on your own. The main goal when owning either machine is to be able to convert your wood to pieces that can be used for your specific projects. Determine why you need a planer. Do you want a planer for the sheer novelty of owning one, or do you actually need a machine to improve your productivity? Do you need one to take the place of another worker? The more important your reasons are, the more you should consider each step in buying a planer. Determine how you plan to use the planer. Take the time to analyze why you need a planer in the first place. Consider how you plan to use in your daily operation. Think about the types of products you create as well as the quantity you expect to produce. Decide on the type of planer you need. Based on how you will use your machine, determine which type of trainer (e.g. portable, jointer combo, hand planer) you need the most. You may decide you need more than one type for your needs. Weigh your priorities. Is weight a big factor for you? Are you concerned about where you’ll be able to place the machine? Determine which aspects of the planer take priority over others. This will help you compare specifications between models and narrow down your choices. Research the various brands. Becoming more familiar with the many wood planer brands is important when choosing your final model. You may find a brand you see as the best among them, or you may find a few models across brands. Here we have a number of woodworking planer reviews to help you get acquainted. Compare models against one another. If you are fortunate enough to find the model or models you like the best, continue your research. Compare your top models against each other and even against top-sellers or competing models. Look at the features that you find to be the most significant. Test it in action. If you can go further and find the model you need in operation, use the chance to get a feel for the machine. This can help you learn how to adapt to it and use it properly, but you may also learn if the planer is a poor choice upon operation. Determine your budget, and do your best to stick to it. One of the most difficult parts of purchasing a new tool is accepting its cost. If your budget is important, make it clear even before you narrow down your choices. Try to stick to or near your budget if possible. If you really need a model that goes beyond it, decide if you are willing to splurge this time. Shop around for the best deal. In order to maintain your budget, you should look around various power tool suppliers to find the lowest prices. Keep looking until you have checked with every provider (local and online) you can find. There is no point in spending more than you need to. Where to Buy a Wood Planer? Choosing the best planer model for your projects is half the battle, but finding the right wood planer for sale in your area can also be complicated. It is simple to drive to your nearest hardware store in hopes of purchasing the model you want, but not all stores will have specific models available. Because of this, it is often much more beneficial to buy wood planers online. You can find models via the manufacturer’s website, but buying on Amazon is an even better option. On Amazon, you have a selection of models available from many brands, and you can find a cheap wood planer due to discounts on retail prices. You may also be able to find used wood planers for sale. If you aren’t sure of the model you want just yet, wood planer rental is also a wise option. Though they come in many varieties, wood planers are incredibly helpful tools that can help you save time and money whether you use them for your business or as a hobby. You have now been equipped with enough information to make a better decision when looking for a wood planer. Based on your own prior experiences and your needs, you must determine which specific model would be the best choice for improving your work. If you feel your woodworking shop is in need of one of these machines, get one as soon as possible and notice the difference it makes in your productivity.